« Should We Turn Our Backs on Animals in the Wake of a Natural Disaster? Join Recycled Dog and internet rescue animal search engine Petfinder on March 15th for Petfinder’s Help Petfinder Adopt the Internet Day. Simply feature an adoptable pet on your website, blog, Facebook page, Twitter account or email with the adoptable pet’s information from Petfinder. Recycled Dog supports Petfinder’s effort to spread the word about the thousands of homeless pets awaiting homes at shelters and rescues. Help a pet find a home on March 15th! 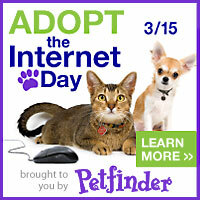 1 comment to Join us for Petfinder.com Adopt the Internet Day! This year was so wonderful! So glad we could be a part of such a wonderful way to gain exposure and possibly find forever homes for so many furbabies.